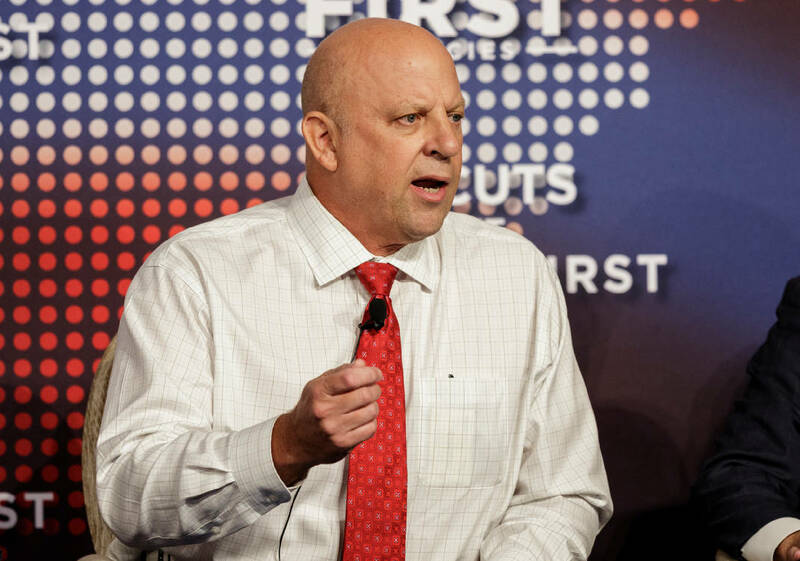 U.S. Rep. Scott DesJarlais sits on a panel during a tax policy event hosted by America First policies at Lee University's Pangle Hall on Saturday, July 21, 2018, in Cleveland, Tenn. Vice President Mike Pence was the keynote speaker at the event, which featured a panel of guests discussing the effects of President Donald Trump's tax bill. This story was updated July 26, 2018, at 7:15 p.m.
NASHVILLE — Republican U.S. Rep. Scott DesJarlais of Tennessee is among 11 members of the far-right House Freedom Caucus, which filed articles of impeachment against U.S. Deputy Attorney General Rod Rosenstein. But the effort, spearheaded by Freedom Caucus Chairman Mark Meadows, R-N.C., and Rep. Jim Jordan, R-Ohio, was later shelved, at least for now, after Republican House Speaker Paul Ryan publicly came out against the effort. Instead, Meadows said he would for now pursue contempt charges if the Justice Department doesn't provide documents that Congress is seeking, The Hill reported. 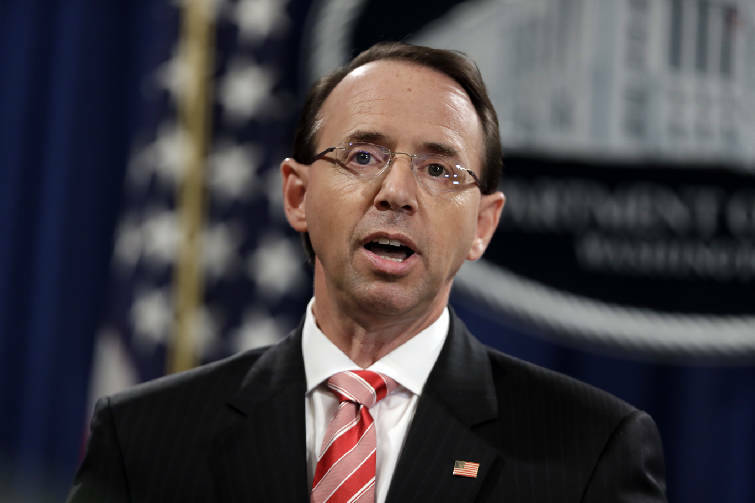 Rosenstein supervises Special Counsel Robert Mueller's investigation of Russian interference in the 2016 presidential election and has come under heavy criticism from supporters of President Donald Trump, who has called it a "witch hunt." Tennessee Democrats are already blasting DesJarlais, a South Pittsburg physician who represents Tennessee's 4th Congressional District. Prior to Meadows' decision to back off, DesJarlais sharply criticized Rosenstein in a statement, saying that after having been "given many opportunities to cooperate with Congress, Rod Rosenstein has demonstrated a chronic inability to answer questions important to our investigation of alleged criminal abuses of intelligence services under the previous administration." DesJarlais charged that "even under subpoena, the Deputy Attorney General has refused to produce necessary documents, because they implicate top Department of Justice and FBI officials, including himself. His own role in fraudulent warrants and wiretapping the President's campaign is a major conflict of interest that renders him unfit to oversee the Special Counsel or DOJ. "Removing Mr. Rosenstein from office is the only option left to Congress," DesJarlais added. The congressman's support of the resolution to impeach Rosenstein, a Republican, drew fire from Tennessee Democratic Party Chair Mary Mancini, who said in a statement it was "a petty attack on our justice system and shows that Rep. Scott DesJarlais continues to prioritize Party over Country. "The residents of Tennessee's fourth congressional district want a representative who will fight for them — not one who spends their time disingenuously attacking public servants." Mancini also said the investigation should continue "because the American people deserve to know the truth. It's clear Rep. DesJarlais would prefer to stand up for the Trump Administration over the interests of the people he's supposed to serve." Meanwhile, Mariah Phillips, a Rutherford County teacher and one of several candidates vying in the 4th Congressional District Democratic primary on Aug. 2, called it "deeply concerning to see Rep. DesJarlais trying to interfere with an ongoing investigation." She said "our democracy depends on having a Justice Department that is independent from political attacks. Rep. DesJarlais should be working on how to solve problems for Tennessee families, not playing partisan games. People in the 4th District are sick and tired of his embarrassing behavior." House Speaker Ryan said earlier he opposed the effort. "I don't think we should be cavalier with this process or this term," Ryan told reporters of impeachment proceedings for Rosenstein, CBS News reported. He added that "I don't think that this rises to the level of high crimes and misdemeanors, that's a really high standard." Ryan also said that since his involvement in the document request process, "tremendous progress" has been made. CBS reported the speaker also said "we all want to make sure we get compliance, different members have different beliefs on how best to achieve those goals, we want to make sure we get DOJ compliance." Meanwhile, U.S. Rep. Steve Cohen, D-Tenn., called Rosenstein the "guardian" of Mueller's investigation into Russian meddling. "The sham pretext for this move is Rosenstein's completely reasonable resistance to turning over certain documents in an ongoing criminal investigation, something that is never done and that would be a breach of his sworn duties," Cohen, a Memphis attorney, said in a statement. While not mentioning DesJarlais by name, Cohen said "it's obvious that the ulterior motive for this effort to impugn the reputation of Mr. Rosenstein is a desperate plan to hobble a probe that is getting too close to President Trump's inner circle." The congressman said Congress should pass the proposed Special Counsel Independence and Integrity Act, a bill co-sponsored by Cohen. It seeks to prohibit any special counsel, including Mueller, from being removed except for legitimate cause such as misconduct, dereliction of duty, incapacity, conflict of interest or violation of Department of Justice policies.